Computation in the brain has been modeled productively at many scales, ranging from molecules to dendrites, neurons and synapses, all the way to the whole brain models useful in cognitive science. I will discuss recent work on an intermediate layer, involving assemblies of neurons --- that is to say, sets of neurons firing together in a repetitive pattern whenever we think of a particular memory, concept or idea. Assemblies have been conjectured six decades ago by Hebb, and have been over the past decade noticed in both the animal and the human brain. Further, experiments suggest that assemblies can be copied from one brain area to another, and associated with other assemblies. Using a simplified model of neuron connectivity and plasticity based on random graphs, we prove that projection (copying) and association of assemblies can indeed be carried out in principle by spiking neurons, with high probability. We propose a broader "calculus" of assemblies, including operations such as "reciprocal-project" and "merge", comprising a powerful computational model. One interesting hypothesis is that assembly operations may underlie some of the most advanced functions of the brain, such as reasoning and language. Joint work with Santosh Vempala, Wolfgang Maas, and Michael Collins. 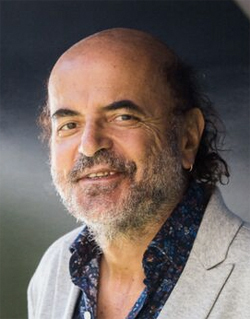 Christos H. Papadimitriou is the Donovan Family professor of computer science at Columbia University. Before joining Columbia in 2017, he taught at UC Berkeley for 22 years, and before that at Harvard, MIT, NTU Athens, Stanford, and UCSD. He has written five textbooks and many articles on algorithms and complexity, and their applications to optimization, databases, control, AI, robotics, economics and game theory, the Internet, evolution, and more recently the study of the brain. He holds a PhD from Princeton as well as eight honorary doctorates, and he has won the Knuth prize, the Goedel prize, and the von Neumann medal. He is a member of the National Academy of Sciences of the US, the American Academy of Arts and Sciences, and the National Academy of Engineering, and in 2013 the president of Greece named him commander of the order of the phoenix. He has also written three novels: "Turing", "Logicomix" (with Apostolos Doxiadis) and his latest "Independence".